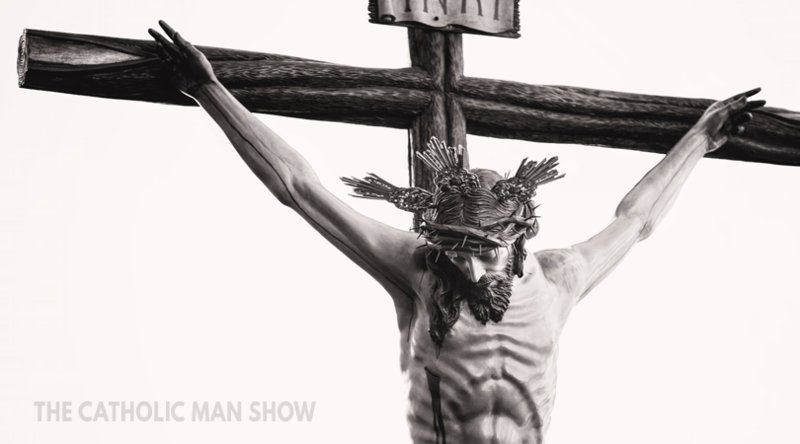 Having been nailed the Cross, Jesus now had an impossible anatomical position to maintain. 6. Jesus’ weight was borne on His feet, with nails driven through them. As the strength of the muscles of Jesus’ lower limbs tired, the weight of His body had to be transferred to His wrists, His arms, and His shoulders. 7. Within a few minutes of being placed on the Cross, Jesus’ shoulders were dislocated. Minutes later Jesus’ elbows and wrists became dislocated. 8. The result of these upper limb dislocations is that His arms were 9 inches longer than normal, as clearly shown on the Shroud. 10. 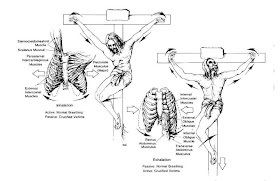 After Jesus’ wrists, elbows, and shoulders were dislocated, the weight of His body on his upper limbs caused traction forces on the Pectoralis Major muscles of His chest wall. 11. These traction forces caused His rib cage to be pulled upwards and outwards, in a most unnatural state. His chest wall was permanently in a position of maximal respiratory inspiration. 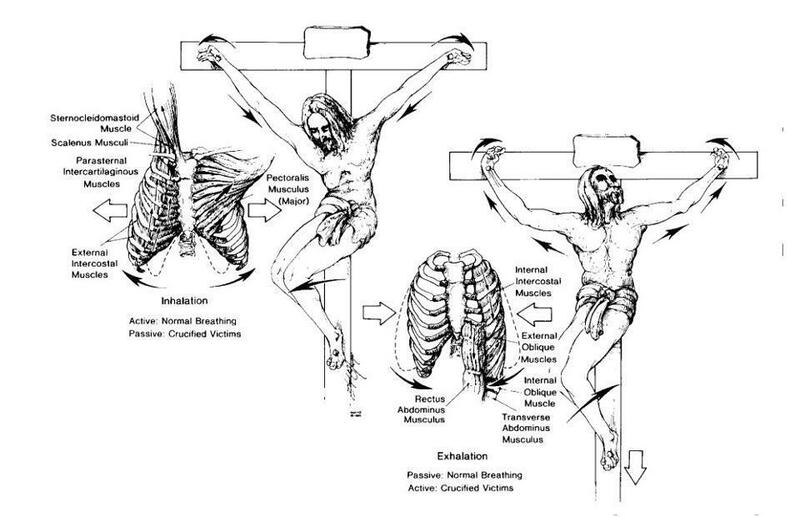 In order to exhale, Jesus was physiologically required to force His body. Crucifixion is a medical catastrophe. 17. As the six hours of the Crucifixion wore on, Jesus was less and less able to bear His weight on His legs, as His thigh and calf muscles became increasingly exhausted. 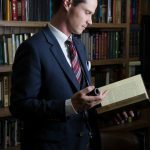 There was an increasing dislocation of His wrists, elbows, and shoulders, and further elevation of His chest wall, making His breathing more and more difficult. Within minutes of crucifixion, Jesus became severely dyspnoeic (short of breath). 23. The blood was a result of the Scourging that nearly killed Him, and the sweat as a result of His violent involuntary attempts to effort to expire air from His lungs. Throughout all this He was completely naked, and the leaders of the Jews, the crowds, and the thieves on both sides of Him were jeering, swearing and laughing at Him. In addition, Jesus’ own mother was watching. 33. Jesus had drunk nothing for 15 hours, since 6 pm the previous evening. Jesus had endured a scourging which nearly killed Him. 38. By about noon Jesus’ heart probably began to fail. At that moment, He gave up His Spirit, and He died. 53. When the soldiers came to Jesus to break His legs, He was already dead. Not a bone of His body was broken, in fulfillment of prophecy (above). Love Him in everything you do! To know and then carry out the prophesy, knowing the pain and suffering He would endure is the ultimate act of Love. Thank you! I thought I had an idea of how Jesus Christ “suffered and died” on the cross, especially after seeing the movie, “Passion of the Christ.” After reading this from a medical perspective and the detailed description of what He was going through I have a much better understanding and appreciation of what He went through for us. God bless you. Wow…i feel sick in my stomach. That is a very descriptive show of love…and to think of how we treat Him! We are a shameful people. I am definitely going to try harder. Thank you Jesus, this article brought an Irish Catholic girl , in the church my entire life, but with little understanding of the suffering that Jesus endured .This has humbled me greatly. Easter with new eyes.